Winter Wonders Video Slot Guide & Review - Casino Answers! Winter Wonders is a 5-reel, 15-line video slot developed by Rival, featuring a wild symbol, scatter wins, multipliers and a free spins feature. You can play the Winter Wonders video slot at Bovada. Coin sizes on the Winter Wonders slot machine are $0.01, $0.05, $0.10, $0.25, $0.50 and $1. You can select from 1-15 paylines at 1-5 coins per line on the Winter Wonders slot game. Winter Wonders is a penny slot, so you can bet anywhere from one cent on a spin up to the maximum total bet of $75 per spin. Winter Wonders has a decent betting range that should appease casual players as well as high rollers. There is an autoplay option available for real money players only. 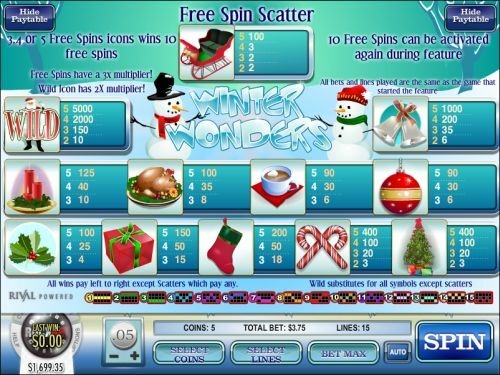 To play the Winter Wonders video slot, select your bet and hit the “Spin” button. Press the “Bet Max” button to play Winter Wonders with all 15 lines selected and 5 coins per line at Bovada. The Sleigh symbol is the scatter symbol on the Winter Wonders slot game. 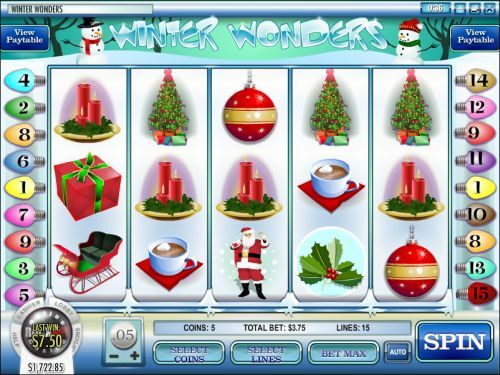 You can win up to 100X your total bet when 5 Scattered Sleigh symbols appear on the reels of Winter Wonders. 3 or more Sleigh symbols anywhere on the reels will trigger 10 free spins with a 3X multiplier. The free spins feature can be re-triggered. All bets and lines played are the same as the game that started the feature. If you’re looking for a Christmas video slot, Winter Wonders is a decent pick. Aside from the theme, the highlight is likely the free spins feature with a 3X multiplier, but you can only win 10 free spins at a time. The top payout is only 5000 coins, which isn’t bad, but not great. You can play the Winter Wonders video slot when you sign up and make a deposit at Bovada. Can USA-based players play the Winter Wonders slot game for real money? Yes, players from the United States can play the Winter Wonders online slot game for real money at Bovada. Where can I play a free Flash game of the Winter Wonders video slot? You can play an Instant Play version of Winter Wonders at Bovada. You can play for free or you can play for real money. If you experience difficulties with the Instant Play casino, make sure you have the newest version of Adobe Flash Player.